At first glance, the nostalgia-soaked silent film The Artist seduces audiences with its fanciful flair and dramatic score. But underneath also lies two of the most surprisingly charming performances of the year. 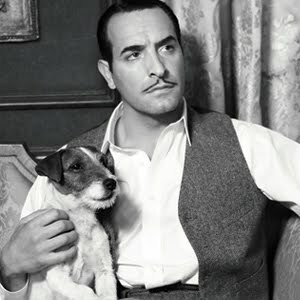 French actor Jean Dujardin captivates audiences as George Valentin, Hollywoodland heavyweight of the 1920s silent era. With a resume stacked high with one box office success after another, the somewhat arrogant George thought his luck would never run out. That is, until his production company decides to jump on the talkie bandwagon. Clinging to his career as the preeminent silent star, George chooses to part ways to try to continue his career on his own terms. Meanwhile, little does he know that while he's off rebelling, a new wave of talkies crash the big screen in a major way, and have elected accidental starlet Peppy Miller to lead them down the pike. In comes Argentina-born French-bred leading lady Bérénice Bejo, who waltzes onto the screen as Tinseltown ingenue Peppy Miller and almost steals every scene from Dujardin. Her feminine daintiness coupled with her easy relatability as a female lead is simply enchanting to watch. Although Peppy bursts onto the scene as a threat to George, a character the audience has already been introduced to side with, Bejo's Peppy is anything but a villain. Representing the new world of cinema, Peppy is still a throwback herself with her wide-eyed elegance and classic stature, but wrapped in a new world package. That said, the contrast between George's resentment of his forced transition and Peppy's fierce innocence of the old world ways is a definitive characteristic of the movie in more ways than one. Where George's lack of desire to move forward has alienated himself from the things he cares most about (with the exception of his Lassie-like dog), Peppy's ambition to propel the new style of cinema makes her a magnet for legions of fans and admirers. But will The Artist be remembered for years to come? More than likely the film will be most remembered because it's a silent movie from 2011, like if an endangered Atlantic Halibut suddenly washed up on a beach one day. It's headline news mostly for the mere fact that it exists at all in this day and age. This won't take away from the loveliness of the film, by any means. The performances from Dujardin and Bejo transcend any possible declaration of a gimmick the film may spark. What the two actors are able to do with this deafeningly silent movie is something many actors today would probably not be able to bring to life as well as they did. Bejo and Dujardin (along with costars John Goodman, James Cromwell and Penelope Ann Miller), in essence, made a musical in silence. But even though there were no words to the story (unless you count the every 15-minutes-or-so subtitles), their large gestures and dramatic (but not overly so) expressions told complete stories. This was further enhanced by the spot-on grandiose score by Ludovic Bource that made you want to dance in the aisle of the movie theater, as well as director Michel Hazanavicius, who made the signature rusty look of a silent movie appear glossy and luxurious. The Artist is simply a pleasure to watch, if only for just two hours in time. Sounds wonderful, can't wait to see it! Maybe not timeless but still impressive. Great blog write-up on The Artist, Candice! I was so unexpectedly taken with the movie and am looking forward to see again and see if the magic is still there.